Lelo in Nopo: A window into "El Jardin"
El Jardin Encantado has awoken and stretched some. She's blooming tulips, lilac, wisteria, forget-me-nots. She's been groomed with zoo doo and organic fertilizer, and has had her weeds plucked. Oh and the pruning. Truckloads of pruned bits have been carted off to the yard debris recycler. While I walk her paths I mainly see what needs to be done, and it's through the photos I take that help me see her beauty. If you click on that photo above, I've labeled in Flickr the plants. My euphorbia collection is at a lovely point in the season right now. There are three different types in this one area. 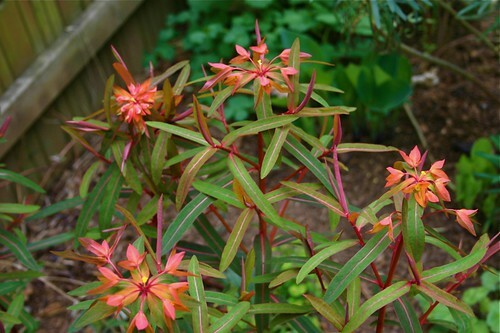 But the stunner right now is Euphorbia 'Fire Glow.' You can see where it gets its name. It's the same family as the poinsettia. 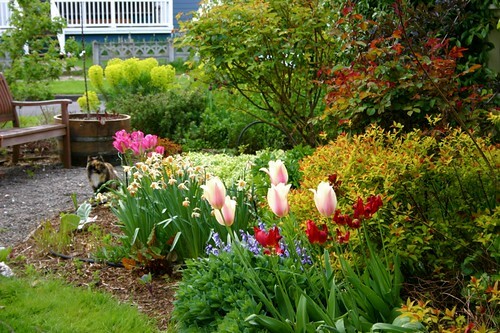 A garden is never "done" and with that, plenty of new projects for El Jardin this year. 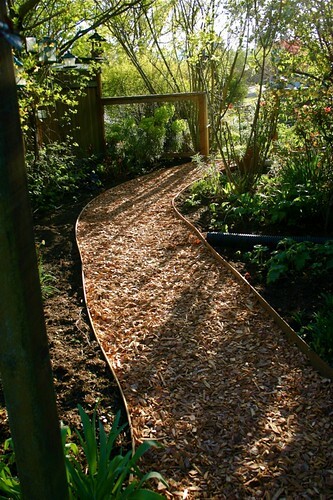 First off, she's been dressed with a new woodland path. The dismal grass that attempted to grow here was simply defeated by too much shade and too much foot traffic. 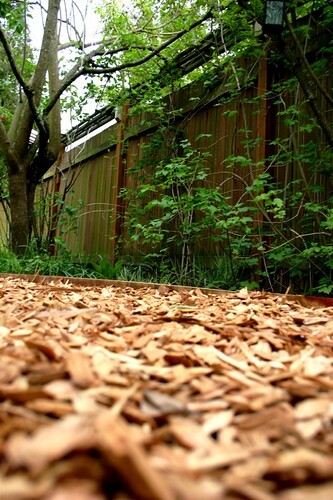 The new path cleans it all up and holds this casual area together. 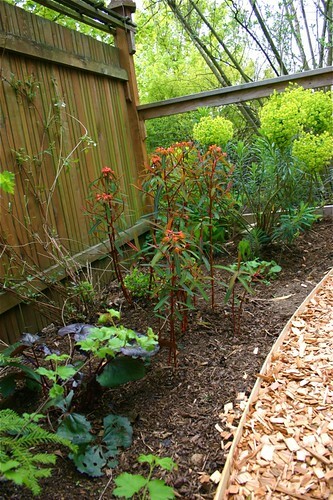 It's an important transition between the front and back garden, and signals the transition nicely. Most importantly, Wink approves of it. Here it is from her point of view. 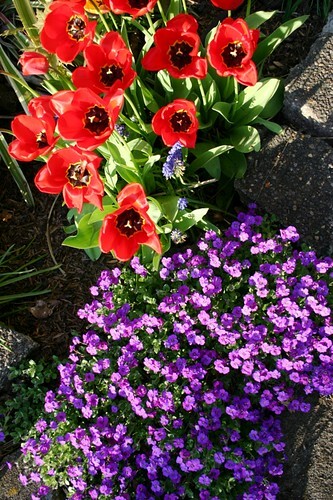 Crazy color combinations at the front corner with tulips and rock cress. We're training Wink to bark maniacly whenever a pedestrian helps themselves to a tulip and picks them. I need to pick a big bouquet of that lilac and bring it in. It's one of my most favorite of cut flowers. You know the secret about lilac in vases, right? 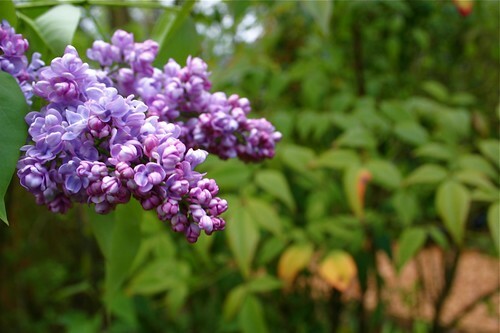 You smash or splice the end of the cut lilac stems to allow them to drink up the water. If you've ever had lilac wilt and droop within hours of being picked and placed in a vase, you know what I'm talking about. Just take a hammer and smash those ends and problem solved. Inhale, exhale. Inhale, exhale. Spring awakens in El Jardin Encantado as do we. Gorgeous! Thanks for the tip about smashing lilac stems. 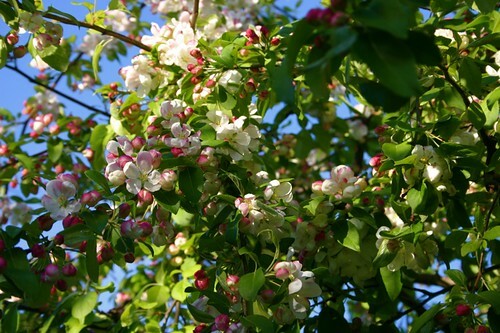 Sadly, I don't have any now but used to have a bunch of lilac trees when I lived in WA. i wish I'd have known that then. Oooh! You know I'm gonna have to send the kids by to snag some of that lilac. Oh my goodness. What a fabulous treat for the eyes. Loved the story(ies) you did for Just Out. They did a bang up job on the layout. Love the scent of lilacs, and did not know the trick for keeping them from wilting. If I ever obtain some, I will be sure to take a hammer to them. Sounds kind of fun! 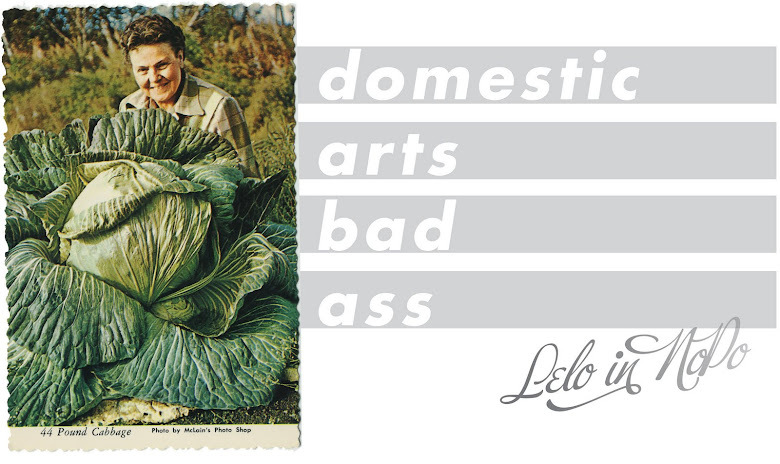 Nice job Lelo. Looks amazing!